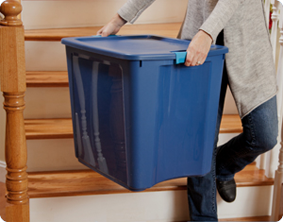 Make moving your storage easier, with the innovative line of Latch and Carry Clears and Totes! Unique through handles are designed to provide full grip access for comfortable lifting and carrying, as well as maneuvering through doorways, hallways, and up and down stairs. The 26 Gallon Latch and Carry is ideal for bedding, seasonal clothing, sporting gear, and other bulky items around the home. 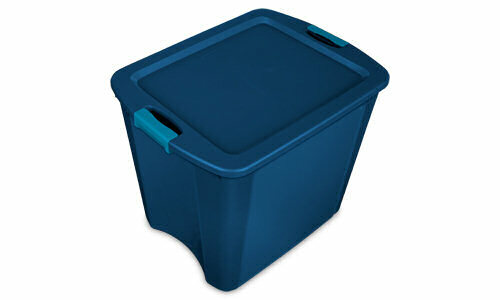 The latches secure the lid to base, keeping items safely stored inside. Available with a clear base for quick viewing or an opaque base to neatly conceal contents. Peel and stick write-on labels allow for easy identification of contents, and dry erase feature allows neat re-labeling as necessary. 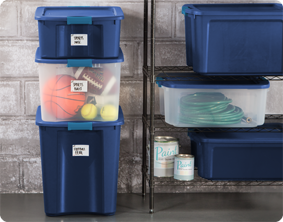 Latch and Carry Clears and Totes give you the versatility to create an ideal storage system with complementary clear or opaque containers in 12, 18 and 26 Gallon sizes. 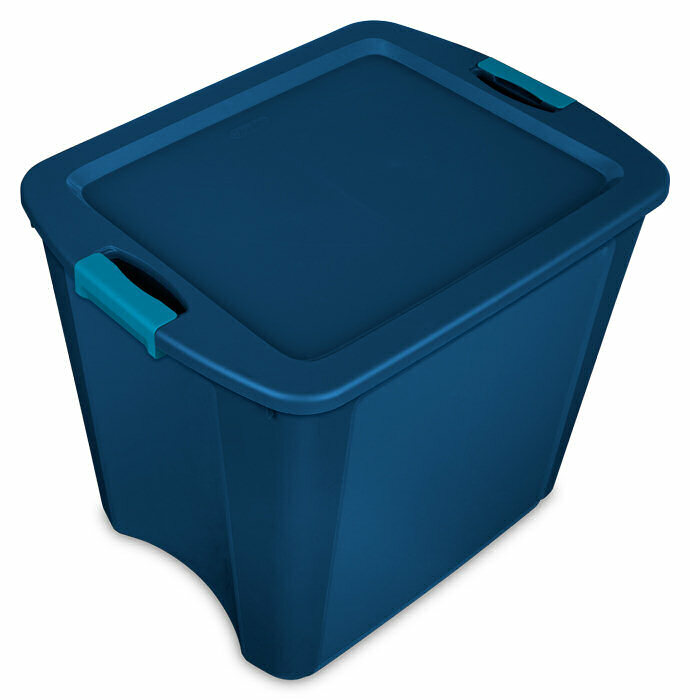 The common lid allows all three sizes to neatly stack in one footprint. The overall assembled dimensions for this item are 23 5/8" x 18 5/8" x 20 1/8". Overall Assembled Size: 23 5/8" x 18 5/8" x 20 1/8"
Unique carry-though handles and comfort grip latches provide full grip access and make moving easier, even up and down stairs! Peel and stick write-on labels allow for easy identification of contents using a dry-erase marker. Simply erase and neatly re-label as needed. 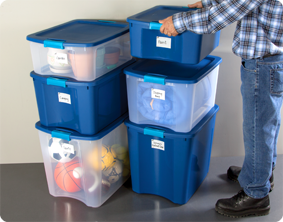 Create your own storage system! Mix and match the three different sizes of Clear and Opaque Totes to select which stored contents should be visible and which should be out of sight. All items share the same lid, for simplified and secure stacking. 26 Gallon Latch and Carry is rated 5.0 out of 5 by 1. Rated 5 out of 5 by RDCrochet from The size is great This is a great product that's made to last. I use it for yarn and craft storage. Not thin like some. Will definitely buy more.